Autumn in my New Hampshire school district. In New England, where I teach, time is measured by temperature. 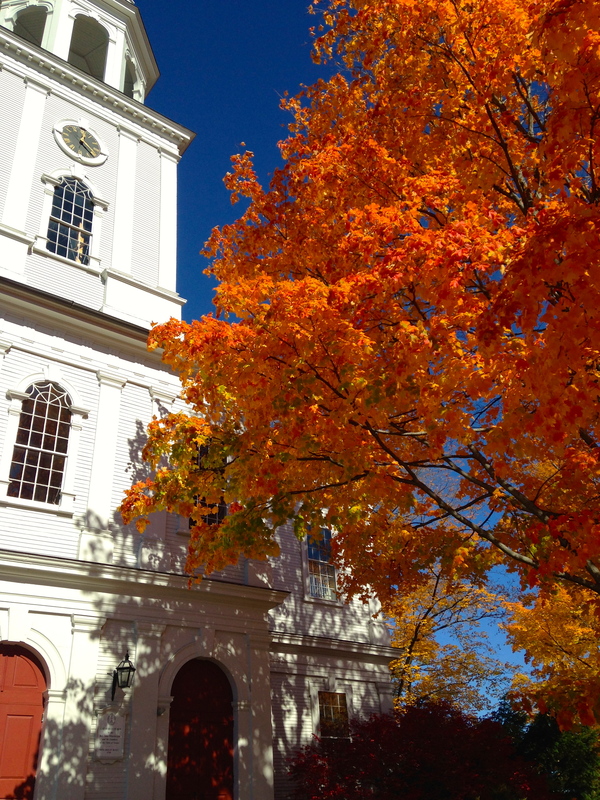 New Englanders cherish Indian summers (the bout of warmth before fall settles in); we sense the bite of autumn, and can smell an oncoming snow. We are a community of seasons, and ultimately these changes dictate the course and development of our year. In turn, to show the development of my classes’ reading progress throughout the year, I drew my inspiration from what New England is famous for—its foliage. To visually represent my classes reading progress within the reading workshop, I developed a reading tree. 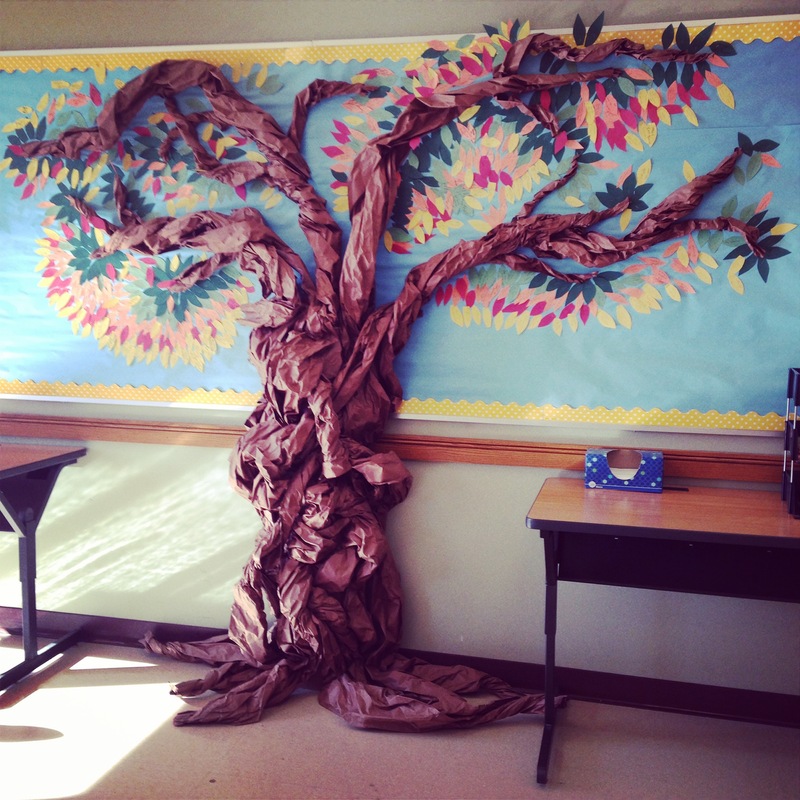 The concept of the tree is simple: for every book read, students received a leaf. On the leaf they wrote their initials, the book they read, and the author. They would then staple the leaf to their class’ branch. In turn, students had a visual representation of their individual progress (because they put their initials on the leaves) as well as their class’ progress. They would look to the tree to see what books were the most popular/appeared on the tree most often. The bare tree before students arrived. 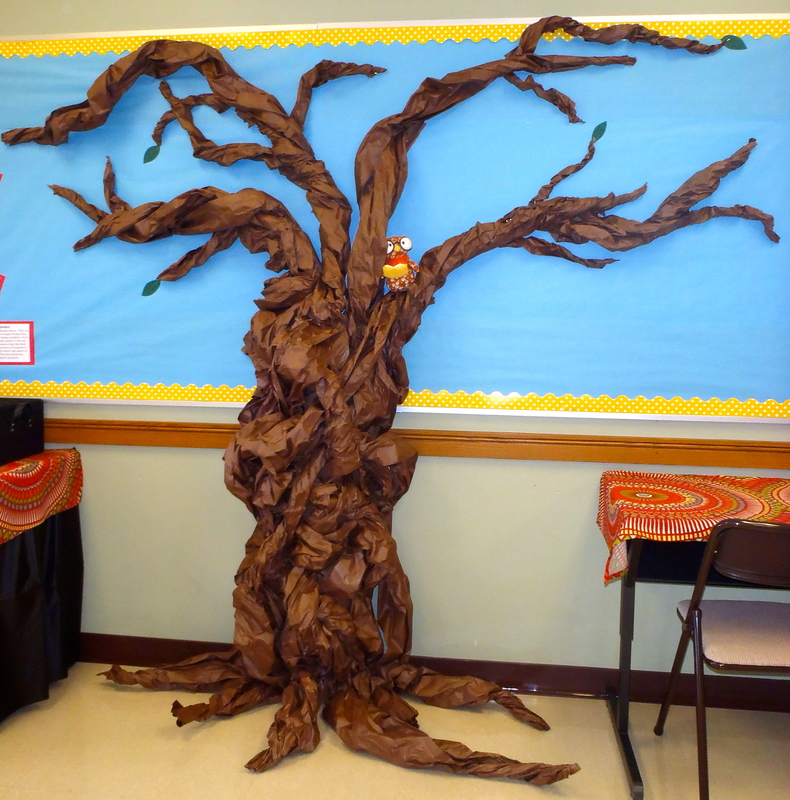 The reading tree exhibits student work and promotes individual success. In addition, it also reinforces teamwork since students look to see how their class is doing as a whole. Furthermore, the tree inspires friendly competition between classes. When I first introduce the tree, I tell students that the class with the most books read wins an ice cream party at the end of the year. This year, due to increased federal health regulations on snacks during the school day, my rules have changed. Instead, students will be able to drop two of their lowest reading scores. Unlike last year, I will tally the total books per class every quarter instead of at the end of the year to determine each quarter’s winner. Construction for the tree is relatively simple and can be used from year to year. Four packs of different colored paper for the leaves. Spray paint the concrete form tube with the two cans of brown spray paint. This will serve as your trunk. Pull large sections of the paper of the ream and begin twisting the paper. As you twist the paper, begin stapling it to the concrete tube using the staple gun. Continue ripping off multiple pieces of paper from the ream, twist and intertwine them as you go along. This will make your trunk look three-dimensional and more realistic. Leave long ends on the bottom. Twist these to a point to create the roots of the tree. Before you get to the top of the trunk, fashion what looks like a strap. I did this by taking a piece of the brown paper and folding it to make a 2’ X 6” rectangle to wrap around the top of the trunk and affix to the wall. I reinforced the back of the piece of paper with brown duct tape. I then put this strap around the front of the trunk where the bulletin board first meets the concrete tube. I stapled the strap to the tree then the excess ends of the strap to the bulletin board to ensure that the tree wouldn’t fall over once it was complete. Finally, I continued twisting individual brown pieces of paper and then layering them by twisting multiple pieces together to create a thicker branch. Make sure to create a branch for each of your classes that will be participating. As you create the larger branches, staple them to the bulletin board. Because the paper is pliable, it is easily to manipulate to look more like a tree. Add smaller branches by twisting additional paper scraps. Cut out small leaves and store them in a jar or bag to give out to students as they finish their books. I usually have a volunteer cut them out for me so that I have a bulk amount for each quarter. Get excited to watch your tree (and readers) blossom! The reading tree full of leaves at the end of last year. While the tree may look complex, it does not take an extraneous amount of time to complete or teach to students. Last year, I allowed my classes to pick which branch they would like to use. Furthermore, I color coded the leaves based on the quarter. Each quarter, I would let my students pick the new leaf color. Green was the first quarter, red was second, orange was third, and yellow was fourth. Just as fall foliage shows the change of seasons in New England, the changing leaves showed my students their development and growth as readers throughout the year. This is such a great idea! I am sp proud of all you’ve accomplished. Your a fantastic teacher and your students are lucky to have you as their teacher! OMG, Jackie! I need one of these trees. While Texas isn’t known for its foliage, we do have trees…and I have readers. I think I just need you to make it for me. How about an estimate on shipping charges? Ha, but seriously. This is a fabulous idea to celebrate reading and visually cheer and motivate readers! Thank you Ruth! I love hearing your feedback, and you’re right, one thing I love about the tree is that it’s flexible and can fit into a variety of classrooms. Great idea for the elementary level. I love this idea. Elementary teachers who have a class all day might want to do this with “required” number of minutes read each night or each week. I just retired and am so thankful that there are teachers such as you 3 who conttinue the quest for the best.